Saturday night was a place in the final against America. Japan and Netherlands were allowed to decide which of the two should play another game on Sunday. Still equal after nine innings because the tiebreaker, was decisive. Japan knew it to score the winning run and they qualified for the final. 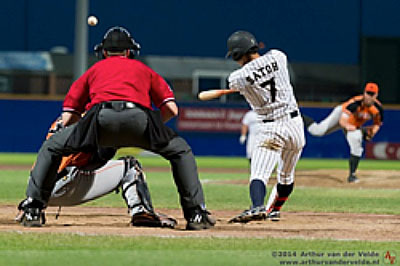 HAARLEM, The Netherlands - The USA Baseball Collegiate National Team advanced to the championship game at Honkbal Week with a 4-1 win in a semifinal showdown against Chinese Taipei at Pim Mulier Stadium on Saturday. With the win Team USA improves to 17-3-2 overall this summer, including a 6-1 record at Honkbal Week. It will play Japan in the championship contest at 2 p.m. local time (8 a.m. ET) on Sunday. Louisville right-hander Kyle Funkhouser will take the mound for the U.S.